All Ear Ivy Cuffs are made by hand to order. Simply slide the ear cuff onto your ear. No piercing required or you may dress it up with a diamond stud or dangle earring. Comes gift boxed with instructions. Very unique and comfortable, wear one and see how many compliments you get! AB stands for Aurora Borealis. In 1956 Swarovski presented the jewelry stone Aurora Borealis, (know as AB) which shimmers in every imaginable color. AB is a special treatment that creates the effect of producing these spectacular crystal beads. Extremely beautiful! 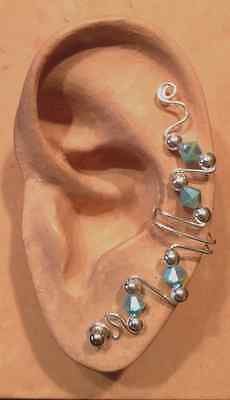 If you are looking for an Ear Ivy Full Cuff with multiple colors, be sure to check out our listing for HANDMADE WIRE WRAPPED EAR IVY FULL CUFF GENUINE AUSTRIAN CRYSTALS - COLOR MIX. 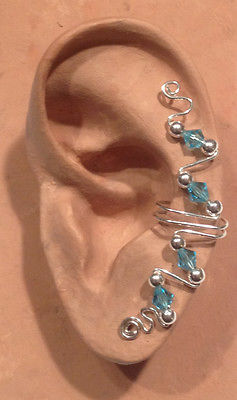 Photo #1 shows and Ear Ivy Full Cuff in Sterling Silver Wire with turquoise crystals. A silver ball stud is shown in this photo but this stud is not included in the purchase price. The turquoise crystal is an opaque (not clear) crystal. I also have a clear crystal available in blue zircon which is a darker turquoise color. Please let us know if you want the opaque turquoise crystal or the blue zircon crystal. If you are looking for a genuine turquoise bead, please order our HANDMADE WIRE WRAPPED EAR IVY HALF CUFF WITH GENUINE SEMI PRECIOUS STONE BEADS with 4mm round genuine turquoise bead instead.